Each year during the summer travel months we try to send a reminder to our clients about how important it is to wear compression socks or stockings for your leg health especially when you travel. Deep Vein Thrombosis which may occur shortly after a long trip has traditionally been called Economy Class Syndrome because of the relatively confined conditions associated with economy class travel. However, a thrombosis (blood clot) is not restricted to such and the alternative term of “Travelers’ Thrombosis” has been suggested. Travelers’ Thrombosis is not exclusively associated with air travel, in fact it has been associated with travel by car, bus or even train following trips as short as four hours. Thrombosis is more common in the left leg, probably because the femoral artery in that leg passes anterior to the vein, and may compress it, resulting in a decreased blood flow (stasis), and possibly a blood clot. Symptoms do not usually develop immediately after travel, but more typically within three days of arrival. Symptoms may manifest themselves as long as 2 weeks after a long trip. Pulmonary embolism (a blood clot that breaks loose and travels to the lung) may be the first symptom, without any symptoms in the lower legs. A study was conducted using 20 individuals…10 with risks for venous thrombosis and 10 without risks. They flew from Vienna to Washington and 2 days later returned to Vienna. Measurements of the legs were taken between the 5th and 8th hr of flight to Vienna, 1 day and 3 days after completion of their travel. The results showed no difference between the two groups, but there was a significant increase in the volume of the legs caused by edema (swelling of the legs) and they remained swollen 1 day after arrival in Vienna. This suggested that sitting in a cramped position, immobile with compression of the popliteal vein (which carries the blood from the knee joint and muscles in the thigh and calf back to the heart) results in venous stasis and thus an increased risk of DVD because of Travelers’ Thrombosis. For those people who have no problems with circulation in their legs, a 15-20 mmHg or “Travel Sock” is quite adequate. For those of us who are already predisposed to leg problems, a 20-30 mmHg or greater is a must! Both unusually tall, and short individuals, are particularly vulnerable to Travelers’ Thrombosis. Most seats used for travel are designed for safety with fairly rigid metal frames. The metal bar at the front edge may compress the popliteal vein and result in venous stasis. 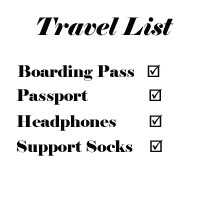 Just remember to wear your support socks or support stockings when you travel and continue to wear them for the next day after your arrival at your destination to make sure your legs return to normal size. As for me I will be wearing my Mediven Sheer and Soft or Mediven Comfort and Rod will probably be wearing the Sigvaris 230 Cotton. For us they are great choices because we are short. Many other folks prefer the Jobst ActiveWear, Sigvaris Recovery, Juzo Silver Sole or the Mediven Motion. Whatever your favorite compression sock or compression stocking, be sure you have it on! specifically for dry, cracked skin. 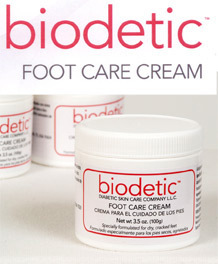 One or two daily applications, rubbed in well, will replenish the skin’s natural moisture resulting in smooth, healthy feet!